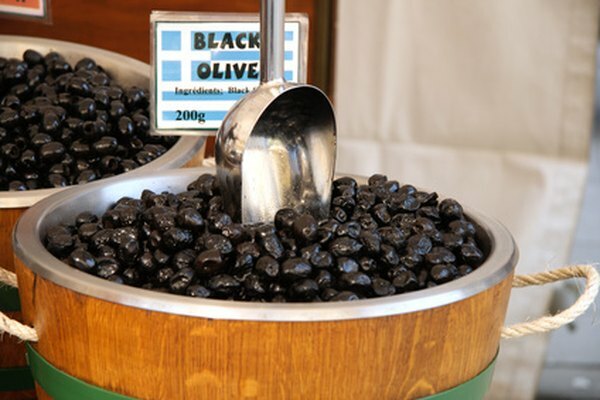 The black olive is a popular snack for children and adults alike. The olive is a fruit that is grown and picked from trees, and can be eaten plain, or used to extract olive oil, a type of oil that is favored by many chefs around the world. It is sweet and salty with a soft texture that contains a number of health benefits due to its high nutrient content. Olives have been grown traditionally for thousands of years, originally in the region of the Mediterranean. Eventually, olives were sold or traded between merchants of other countries including Europe and the Americas. Olives change in color and shape, depending on when they are picked. Green olives have a bitter taste due to the presence of the chemical oleuropein. Olives that have been fully ripened by the sun are black. The olive is extremely bitter if it is freshly picked, therefore it is necessary to cure the olive, or soak it in a brine, oil or water before consuming. One medium-sized black olive contains roughly 7 calories. According to TheDietChannel.com, one serving of 20 small black olives contains less than 100 calories and contains fiber, iron, vitamin E and copper. Calcium and sodium are also found in olives. The calorie breakdown of the olive includes: 21.8 percent of carbohydrates, 11.1 percent of saturated fats, 72.5 percent of unsaturated fats and 2.9 percent of protein. Olives are associated with improving heart health because of their high content of monounsaturated fats, which help lower LDL, the bad cholesterol in the body. Olives contain antioxidants, called polyphenols, which fight against the development of some diseases in the body and stimulate the immune system. Vitamin E is also abundant in olives, which helps the development of skin cells, and also protects other cells from getting damaged by harmful chemicals that may be present in the body. Xomba.com explains that the presence of monounsaturated fats, vitamin E and polyphenols mutually work to reduce the risk of heart disease and cancer. Black olives can be mixed in with lettuce or pasta salads, as a topping on pizza or as a simple snack by itself. The Diet Channel suggests making olive tapenade by combining olives with garlic and oil and blending the mixture in a food processor. The tapenade can be used as a spread, or as a cracker or vegetable dip. Olive oil can be is used in cooking and baking, and is abundant in healthy, monounsaturated fat. Avoid eating olives that are soaked in ferrous gluconate or pickled in vinegar if you are sensitive to very acidic foods, as these liquids are high in acid content. While olives have many health benefits, be cautious about eating too many olives at once, as this can cause temporary upset stomach and digestive discomfort.